As a VASF Cultural Bridges Fellow, I spent approximately 3 months working on the ThriiveCapital Loans project and the Mending Communities Initiative (MCI) in Hue, Vietnam. Prior to the Bridges Fellowship, I spent 9 months working with the Friends of Hue Foundation as a Development Analyst on the ThriiveCapital Loan project, and following the Fellowship I began working as a staff member of the Friends of Hue Foundation. Although my formal VASF Fellowship timeline was from mid June through mid September, this report will describe my work experiences through October 2011. My project proposal for the Bridges Fellowship was largely focused on working with the MCI project to establish an Artisan Center. As soon as I started my fellowship in June, the ThriiveCapital Loan project took priority due to the imminent opening of applications for the ThriiveCapital Loans. For the next month and a half, my time was largely spent on Thriive contributing to the Biannual Report, drafting the Operational Guide, rewriting the Thriive Loan Application, Marketing Message, Marketing Flyer, surveying potential charity goods recipients, and developing survey’s to 1.) Examine growth within business and 2.) Evaluate the effectiveness of the vocational training programs with the other VASF Fellow, Traci Pham. Due to my experience with Thriive, I was able to contribute feedback based on last year’s success and failures and provide a critical take on how to further improve these different components. It was extremely beneficial for me as a team member and for the project in general to have Traci, an experienced lawyer who can transfer professional skills such as consistency, streamlining and operational efficiency into our project’s at FHF. The second half of my Fellowship focused on a different component than planned of the MCI project. FHF partnered with the CEO of Fashion 4 Freedom, Lanvy Nguyen, to develop, manufacture and export abroad high quality goods from Thriive businesses and Village Co-operatives based in Hue. 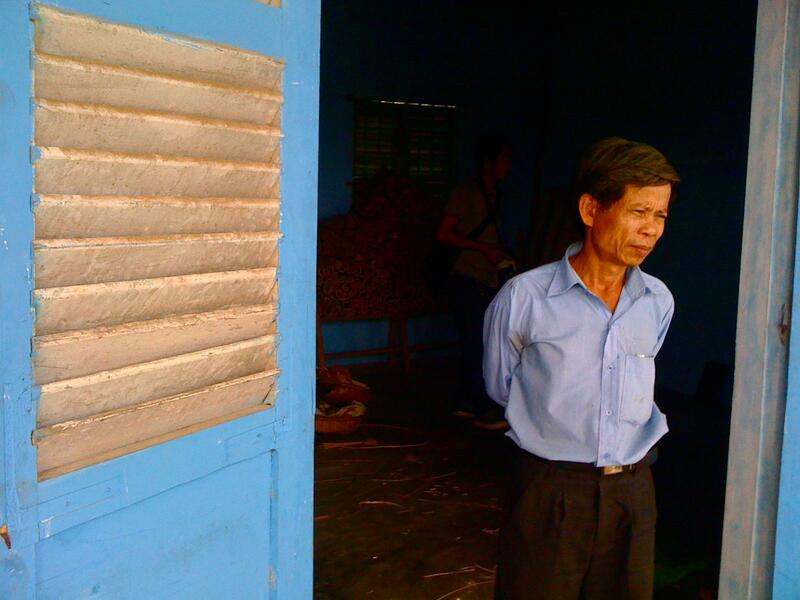 Due to a host of reasons- such as Hue’s inhospitable climate and the conservative local government- the central region of Vietnam has fallen behind socioeconomically and missed out on all the manufacturing opportunities which have brought development to the other regions on the country. The political capital in the North and the fast paced international hub in the South have fostered an environment for international investment and development, while the central region has stayed stagnant and it’s small and medium enterprises and village co-operatives have felt the price. 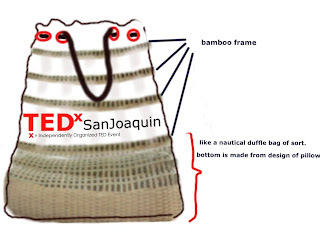 An opportunity arose to provide promotional gift bags at the TEDx Sanjoaquin Conference, which was being organized by a Board member of FHF. LanVy Nguyen was invited to speak, organize and design the promotional gift bags at the TEDx Conference. This provided a great occasion to experiment wit the Village Co-ops and Thriive businesses to design and manufacture their products to test on an international market. So for the next month and half, I worked directly with LanVy through email and Skype to manage the product development and manufacturing of product’s for the TEDx Conference. The original plan was to capitalize on our network of Hue Thriive businesses. We first approached Lin’s Tailor, one of our most developed Thriive businesses, and requested them to make a sample canvas bag. The owner was hesitant since he specializes in suit making and custom dress clothes orders. Then, we realized how difficult it would be to source the canvas material in Hue. Although this material is plentiful in Saigon and Hanoi, one of the many challenges of working in Hue is finding the right materials locally. The idea of this project is to promote all local businesses and local materials, so we moved on to another idea. 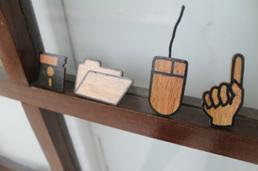 While meeting with another Thriive business, a young lacquer artist who runs Then Studio, we discussed the idea of creating lacquer pins with a ‘techy’ theme for the participants of the TEDx Conference. We presented him with small j-peg images of a keyboard, computer mouse, floppy disc, clock, a hand and a bicycle. He worked with a carpenter to carve the images into thin wooden objects, then placed thin stickers on each pin to design the inside content, which was finally covered by a lacquer enamel, darkening the wood. While working with Tuan, the lacquer artist, he showed us a bamboo pillow he designed with another one of the Thriive businesses, Bao La Village Bamboo Co-operative. 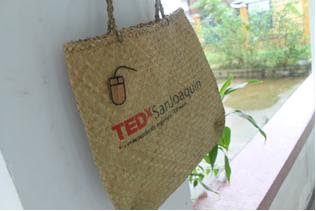 This pillow sparked the idea to create bamboo promotional gift bags for the TEDx Conference. LanVy then designed a bag based on the bamboo pillow, but gave the team in Hue creative freedom to change whatever was logistically necessary. There turned out to be quite a few changes! Working with Bao La became the most frustrating part of this project, yet taught me a tremendous amount about global trade and village development. 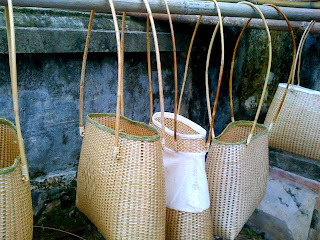 We primarily worked with the designer of Bao La, Chu Hong, a 60 year old, High School graduate, with no formal design education, but who has carried Bao La Village to win prestigious awards at Handicraft Festivals all over the country and to the well-respected reputation Bao La has today. 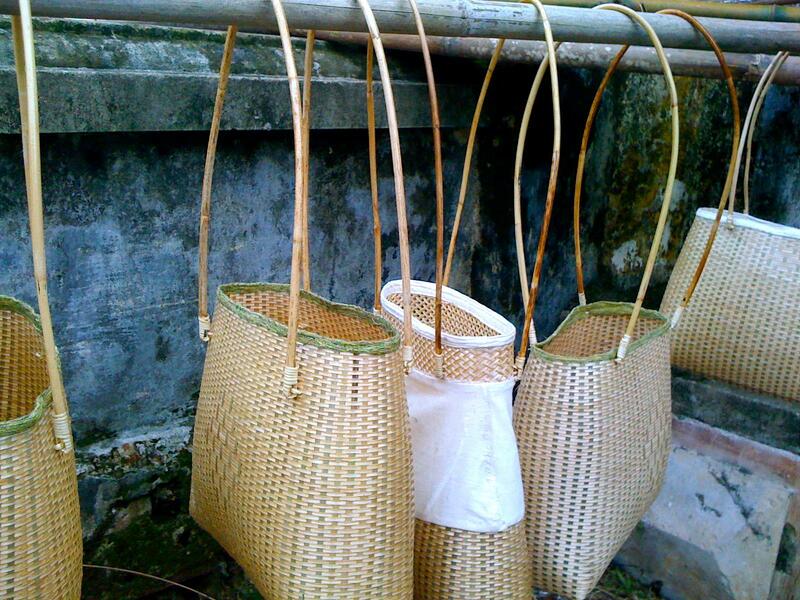 We began working with a straw village 50 km outside of Hue as soon as we realized the bamboo bags would not be done in time. 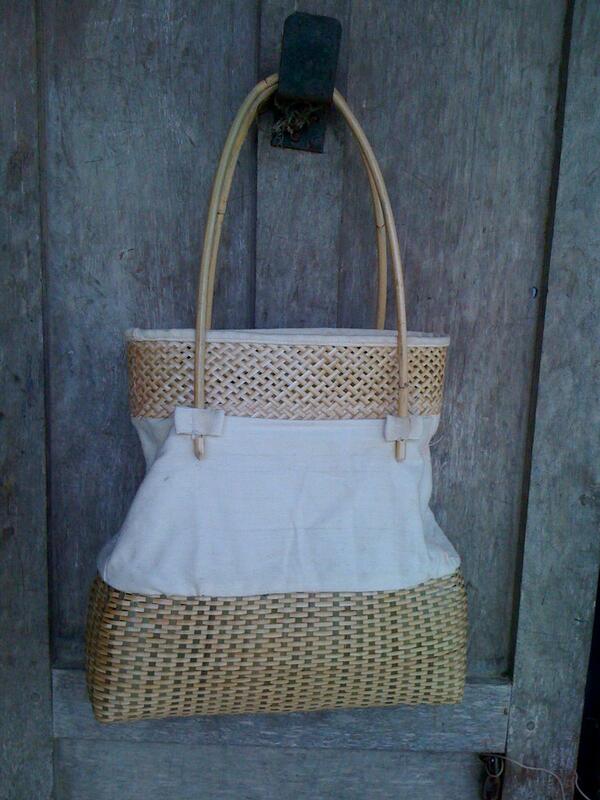 Straw bags are simple, cheap and easy to make. Yet similar to Bao La, all the co-op members were preoccupied with finishing the harvest and working on the fields before they could complete the order with the straw co-op. Tuan, the lacquer artist, then got referred to a family friend who sells straw bags at the largest market in Hue, Dong Ba. We approached the woman requesting an order of 100 straw bags (which she sourced from the straw village) within 1 week. Due to the short time period, we paid 12,000 VND per bag instead of 8,000 VND ($0.60 cents vs $0.40 cents) but received them right on time. 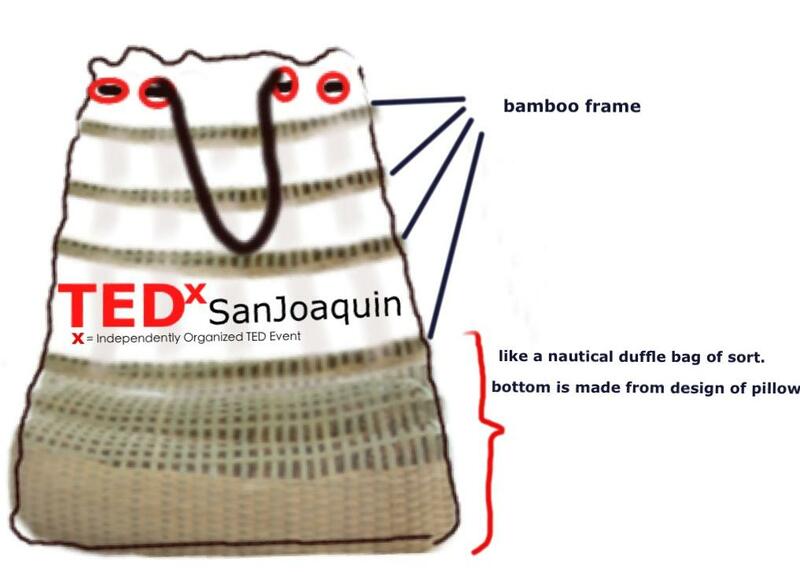 We then sent the straw bags to another Thriive business, Minh Thi Printing, to have the TEDx San Joaquin logo be printed on the bags. Within another few days, we had the finished product! Although the components of the MCI project are shifting based on the needs and situation on the ground, the philosophy behind the project stays the same; providing small and growing businesses with the knowledge and resources to produce high quality goods as well as expand their product line and clientele internationally. 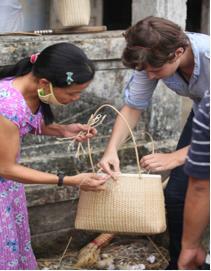 This project was a learning experience for the FHF staff and the small businesses and village co-operatives involved. The experience provided me with a thorough understanding of some of the operational obstacles that hold back village co-operatives with beautiful and easily marketable products: unmet deadlines, misunderstanding of a ‘finished’ product and lack of knowledge of the foreign market. In addition to the operational obstacles, the real trials and tribulations arise due to development and cultural issues such as heavily relaying on the harvest each year and the working culture which doesn’t stress taking creative risks, strict timelines, and thorough questioning when one doesn’t understand. Challenges aside, we managed to export a beautiful finished product to California in time to showcase the creative and well-crafted product’s Vietnam, and specifically Hue, has to offer the world.